State of the Environment Norway is a website that aims to provide online information about the latest state of – and developments in – Norway's environment. SOE Norway is used to compile the country's national State of the Environment report. The Ministry of Climate and Environment has assigned the production of SOE Norway to the environmental authorities. The Norwegian Environment Agency has the overall editorial responsibility for the website. These all have a separate thematic approach, with indicator-based assessments and data reflecting the state of environment. An updated national indicator catalogue was made available online in 2014. A major objective of environment.no is to create an understanding of the relationships between environmental conditions, what affects these relationships, and the need for measures to improve the state of the environment. In general, the state of the environment in Norway is improving. For instance, there are positive trends in water quality, air quality and waste management. But hazardous substances are becoming more widely dispersed in the environment, and are found in more and more species. Biodiversity is under pressure in Norway as well as other parts of the world. Major environmental pressures in Norway in the years to come are likely to include a continued trend towards urbanisation, increased energy demand, and an increase in the rate of climate change. Climate change: Norwegian greenhouse gas emissions rose by around 5% from 1990 to 2013. A long-term trend of a rise in total emissions towards 2020 is expected, unless new measures are implemented. Many changes caused by climate change have already been observed in the Norwegian natural environment. CO2 emissions rose by 27% from 1990-2013, mostly due to increased oil and gas production, but from 2010-2013 CO2 emissions have slightly decreased (down 2,9%). Biodiversity: In the past 100–150 years, human activities have resulted in far-reaching changes in Norwegian nature. Changes in land use are among the greatest threats to biological diversity. Local variability in habitats and species composition is being reduced, and some species are being wiped out. Almost 4 000 species are on the current Norwegian Red List, and half of these are threatened. Invasive alien species also cause harm to local fauna and flora. The extent of areas without major infrastructure development, including wilderness-like areas, is shrinking steadily. For the country as a whole, the proportion of wilderness-like areas has dropped from 48% to less than 12% in the past 100 years. Fresh water: Norway's rivers and lakes provide a rich freshwater environment, which is under less pressure from human activity than many countries in Europe. Challenges still remain as many rivers and lakes are altered due to hydropower regulation, urbanisation, and roads. Around 25% of Norway's water courses are at risk of not obtaining good ecological and chemical status in 2015. Long-range transboundary pollution causes acidification and brings hazardous substances to lakes and rivers. Air quality: Air quality in Norway generally has improved since the 1990s. However, many people in the larger towns are still affected by local air pollution, and some limit values are still exceeded every winter. In Norway, between 500 and 2 000 people die prematurely every year because of air pollution. Children and the old are the most vulnerable. In the largest towns, current knowledge indicates that particulate matter and nitrogen dioxide pose the most serious risks to health, and result in a higher frequency of various types of respiratory problems. Waste: In Norway, waste volumes have increased by almost 40% since 1995. As much as 87% of non-hazardous waste is recovered, and 95% of hazardous waste is collected. Pollutant releases from waste treatment have been reduced in recent years. Economic growth is one reason for the rising quantities of waste. Marine Areas: Norway's marine areas are rich in resources and biodiversity. Pressures on these resources and biodiversity come directly from human activities such as aquaculture, extensive fishing, and oil and gas production. Other indirect pressures include climate change and ocean acidification. The Norwegian government is therefore developing integrated marine management plans for all Norwegian marine areas. Many coastal areas and fjords are contaminated by hazardous substances from present and previous industrial activity and dumping. Reductions in emissions of hazardous substances – and the clean-up of contaminated marine sediments – have resulted in improvements in the state of the environment in several places. Noise: Noise is the environmental problem that affects the largest number of people in Norway. Nearly 1.4 million people are exposed to noise levels above 55 dBA outside their home. The number has increased by a quarter of a million since 1999. Sleep disturbance due to noise affects 200 000 people in Norway. Climate change and the transition towards a green and sustainable society are amongst the main challenges and environmental concerns in a wider and cross-sectoral context in Norway. The objectives and principles of Norwegian climate policy are anchored in the broad political agreement reached in the Norwegian parliament between 2008 and 2012 and updated by a white paper on Norwegian climate policy and Norway's sixth National Communication under the Framework Convention on Climate Change. The climate agreement includes measures and checkpoints for following up on the climate policy. Among other things, the agreement refers to sector-specific climate-action plans and targets for individual sectors. Climate-change adaptation is also a growing concern in Norway and has been addressed through the white paper "Adapting to a changing climate - Norway's vulnerability and the need to adapt to the impacts of climate change". Sustainability should be a fundamental principle for all development in Norway. The government's strategy on sustainable development (presented to the parliament in the national budget for 2008) and the latest Nordic strategy "A Good Life in a Sustainable Nordic Region" (2013), confirms that a policy for sustainable development must be based on the principles of equitable distribution, international solidarity, the precautionary principle, the polluter-pays principle, and the principle of common commitment. In Norway, there is an increased awareness around the value of ecosystem services and their connection with sustainability. Adequate knowledge about the state of ecosystems and their ability to deliver services (and how human activities affect this ability) is a necessary precondition for good nature management. Cities of the Future is an example of an innovative approach supporting the long-term transition towards a more sustainable Norwegian society. Cities of the Future was a collaboration between the government and the 13 largest cities in Norway to reduce greenhouse gas emissions and make the country's cities better places to live. The programme ran from 2008–2014. The programme has helped city municipalities to share their climate-friendly city development ideas with each other, with the business sector, with the regions, and with the government. 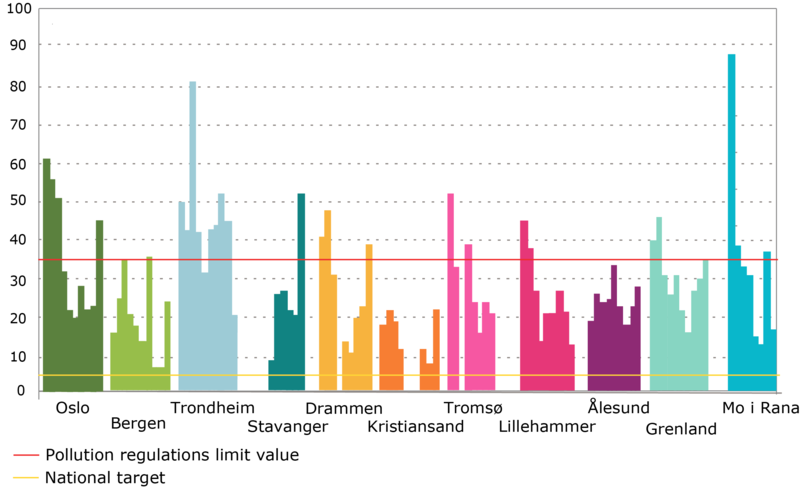 By including the 13 largest cities in Norway, Cities of the Future included almost half the country's population. Reduced greenhouse gas emissions were the main goal of the project. Its main focus areas were land use and transport, consumption and waste, energy and buildings, and climate-change adaptation. An improved urban environment and cooperation between cities and businesses were secondary goals of Cities of the Future. The programme identified specific projects and actions that could lead to structural changes. Reduced pollution and an improved urban environment can, for example, be achieved by building more densely, and by enabling people to walk and cycle instead of using cars. Fewer cars and roads will make more room for bike paths and parks. The parks will also help to absorb the increasing rainfall expected in the future, and at the same time create greener and more pleasant cities. Infrastructure for public transportation must be included when planning for new living areas or business areas. The website miljokommune.no is another project that aims to improve municipal commitment to the environment by providing guidance and advice to local authorities in relation to environmental issues. The Directorate for Cultural Heritage, The Norwegian Polar Institute, The Norwegian Radiation Protection Authority, The Norwegian Environment Agency. "The Government is following up on the Climate Agreement"